It’s been a long summer for a baseball fan here in Detroit. The Tiger’s have personified mediocrity this year and, with the small fire sale that we had last week (trading off David Price, Joakim Soria and Yoenis Céspedes) and the surprise dismissal of team architect Dave Dombrowski, we’re settled in for a pennant chase-less autumn for the first time in quite a few years. It’s at moments like this one can turn to drinking – luckily for me there is a cabinet full of nice bourbon’s for me to try and write about, regardless of the Tigers score. 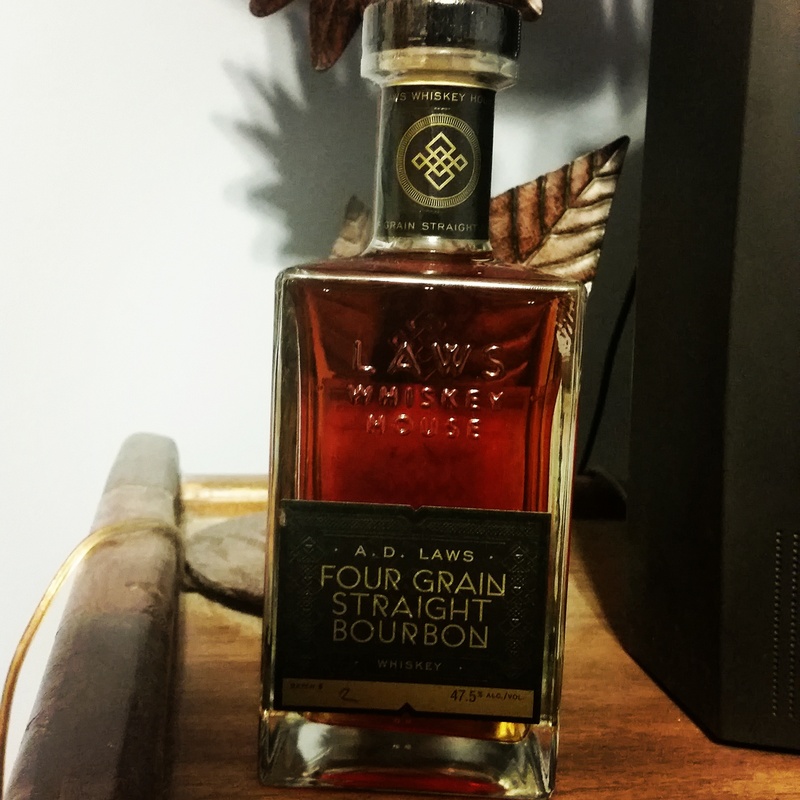 So we get back into the swing of things with a taste of Heaven Hill‘s wheated entry, Larceny. For those familiar with the blog, you know that I am a sucker for ‘wheated’ bourbons – that is, bourbons that use wheat instead of rye in the distillation. Now of course rye or wheat are used sparingly in the distillation of bourbon proper anyway, but wheated bourbons have a more sweet, rounded flavor without much of the spicy punchiness rye brings as a grain. Most of my favorite bourbons – W.L. Weller, Maker’s Mark, even Pappy Van Winkle (and the famous Jefferson Presidential Select 18 year) have been wheated bourbons. So Larceny has an advantage right off of the bat. Old Fitzgerald, to which “Pappy” introduced the wheat, was produced by the Stitzel-Weller Distillery until, the brand was sold in the early 90s to Heaven Hill. 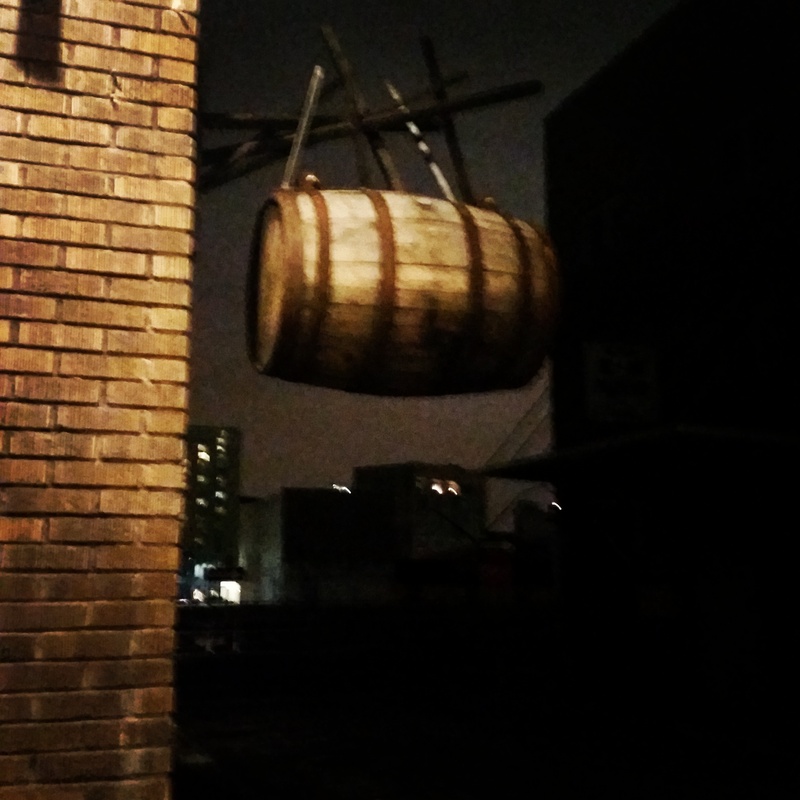 In 2012, Heaven Hill began bottling Larceny as an homage. A true “small batch” consisting of 100 barrels of 6-12 year old wheated bourbon bottled at 92 proof, they sent Larceny into the market, albeit limited. 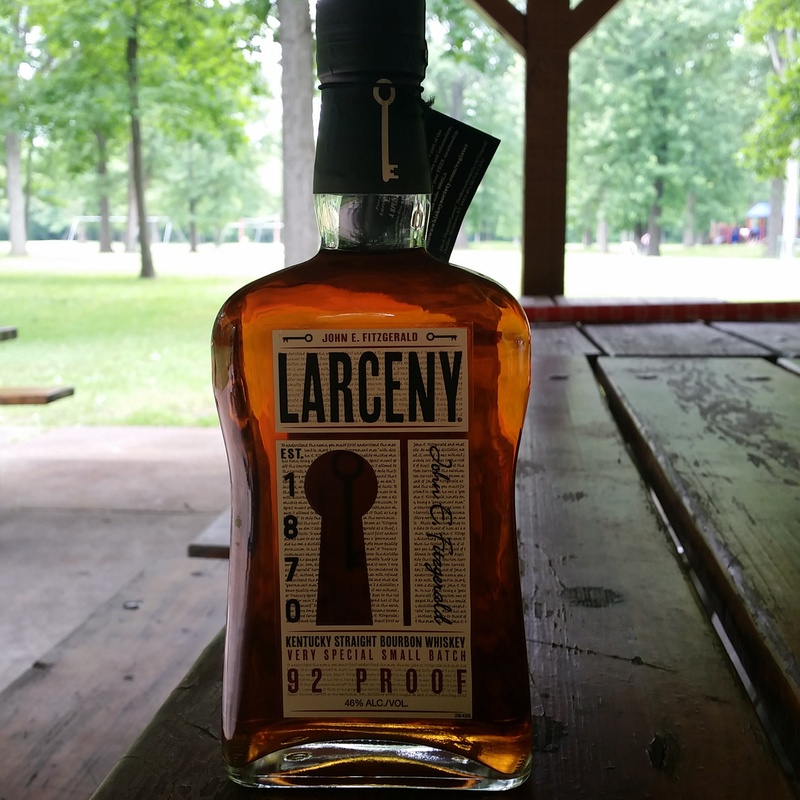 Larceny is, for example, still largely unavailable in Michigan, and it was only on one of my trips to Kentucky I was able to wrangle a bottle of the very affordably priced ($26) bourbon. So how did it taste? Right off the bat, Larceny has a nose that declares its wheated mashbill. There is maple syrup, and a nice oakiness right from the start. Let the glass sit for a few, and it opens up a little more to a butterscotch, toffee and even a hint of honey. Blending with the oak, it makes for a nose that leans into a deep sweet aroma. The taste was a little sharper than I anticipated – despite the lack of rye, the first sip had some bite to it. The mouth feel was thinner than I expected for the recipe and age – it wasn’t thin like a young bourbon, but didn’t have the creaminess I expected. That said, it had a great flavor – toffee was in front and strong, with tiny sparks of cinnamon behind it (which owed it’s presence to age instead of rye). The drink was very smooth, and the toffee/vanilla with a little grit brought a smile to my face. The finish was shorter than I expected, but very nice and smooth. All in all, I enjoyed Larceny very much, but I suppose that’s not a surprise. And for the price, I found it to be right on par with Maker’s Mark, and close to my beloved Old Weller 107. I’m back. Not that you necessarily noticed I was missing, but I took a short sabbatical from reviewing and posting about bourbon (don’t worry, I took no sabbatical from drinking it!) to take care of some things and recharge. And I’m glad to say I’ve come out the other side refreshed, recharged and ready to go! In the summer months ahead, I have a ton of whiskies to review, ballparks to cover and other fun reads to post. So on with the show. I certainly hope everyone had a great Memorial Day weekend – I certainly did, with a trip to see friends and family get married in St. Louis and New York City, respectively. 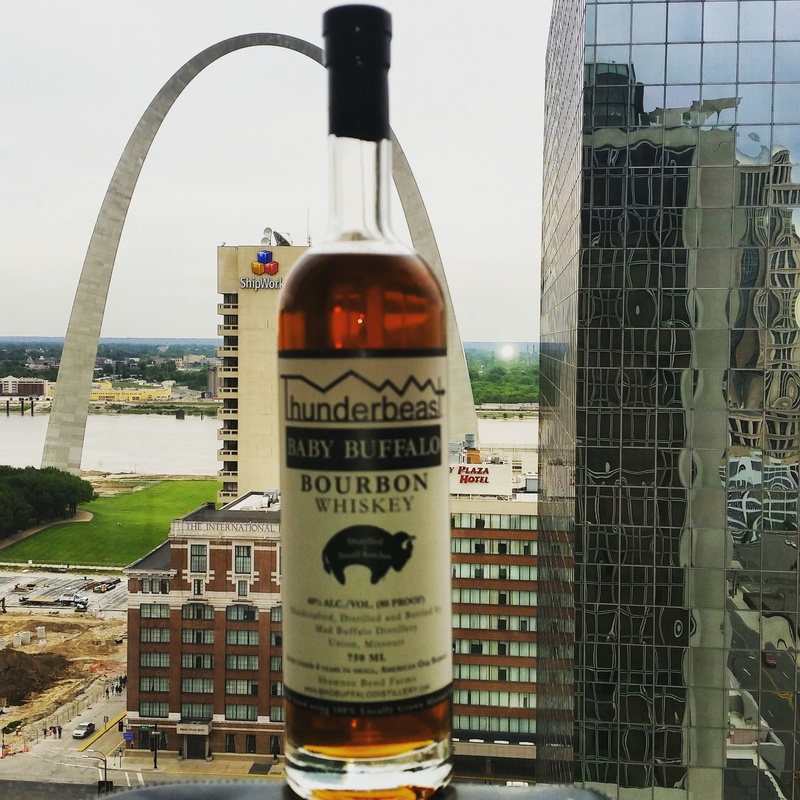 Not only were my journeys an opportunity for my wife and I to spend time with many great people we do not see enough – it was also an opportunity to pick up and try some tasty regional bourbons. 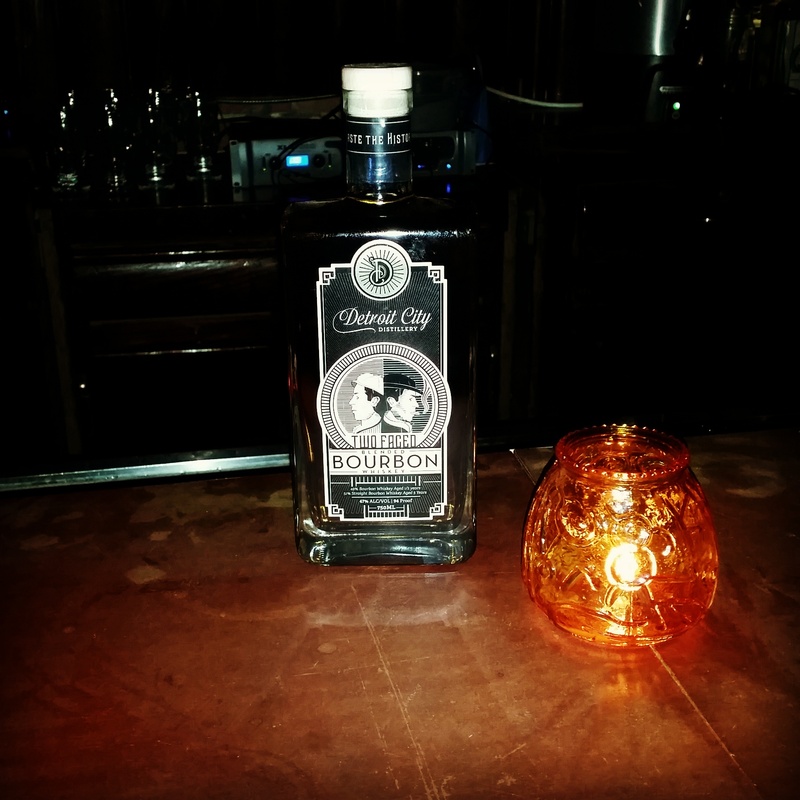 That’s where we start today – with Brooklyn’s own Kings County Distillery Bourbon. Kings County Distillery has been on the scene for a little while now. Founded in 2010 in a building in the Brooklyn Navy Yard, Kings County Distillery is the definition of artisan distilling. They do not and have never sourced their liquor, distilling and aging it on site. Even the grains come from a nearby Brooklyn farm, and their pride in sustainable, local distilling is strong. I first became aware of Kings County this year at the Bourbon Classic, where Master Blender Nicole Austin joined a host of bourbon and whiskey legends for the panel discussions and tastings. Unfortunately for me, the Kings County booth proved so popular that I never got a chance to make my way up for a sample. No mind, I was in NYC and it seemed an ample opportunity to check it out. I had hoped to give the distillery a tour – and will make a point to in the future – but on this trip time was tight, so I used the distillery’s handy site and found a store right by our hotel where I could purchase a bottle. (As a note, if you are in NYC and looking for a fantastic collection of whiskey, check out Bowery and Vine if you haven’t already. Great selection, and fun service.) Bottle gotten, and back home – time for a tasting. Dan’s take: First thing first, I do love the packaging. A hip flask bottle befitting a local distillery with a throwback touch. I do wish I was able to pick up a fifth, as a pint or half-pint were the only choices available. That said, it’s a pricey pour at $45 a pint, so my wallet is happy for the smaller size. The color was a rich amber, not so young as to give away the relatively young age (anywhere from 1-4 years). 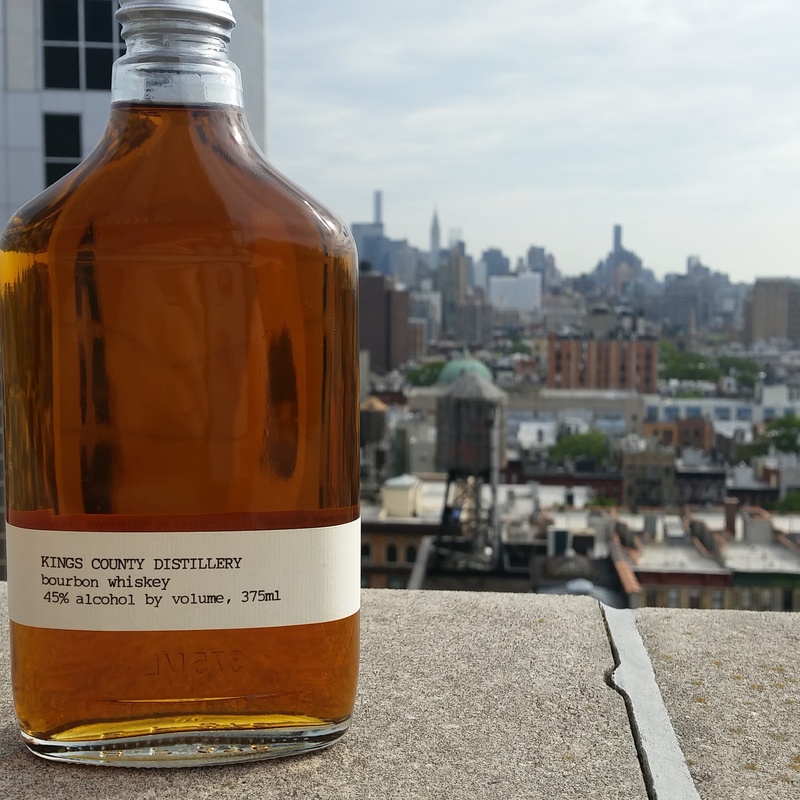 Kings County makes their bourbon from NY corn and UK barley – they don’t mention rye – and the nose is very strong of the sweet corn smell. There is an almost perfume-like note as well, like dried raisin and honey. It took a few minutes to fully open (it is 90 proof), and when it did, the corn was most present. The mouth feel was thick and slick, with a viscosity I also didn’t expect. It was soft, and buttery, and made for a most enjoyable sip. Admittedly, it tasted young, and not as sweet as the nose, but very smooth. Hints of cinnamon and light caramel presented, but I didn’t note any vanilla or maple. There was no bitterness to speak of, and the corn sweetness carried it through to the finish. Again, cinnamon was obvious in the finish, but it would not be unfair to say that the smoothness, rather than any particular flavor, was the primary observation. The finish was relatively short, without a real burn. Blind tasting it, I may have known it was young, but how young I wouldn’t have suspected. It does not have the complexity of an 8/10/12 year pour, but does have a sweet smooth finish rarely found in something so new. Overall, I was impressed. This is a nice bourbon, distinctly…well, Brooklyn! Happy holidays! Hopefully you all had a wonderful holiday season as we did here at Baseball and Bourbon, sipping fine bourbon by the fire with loved ones. We were spoiled here, with a few new bourbons finding their way into our tasting collection as well as some well loved regulars. I can’t wait to pop the cork on all of them, and today I start with a bottle of Col. E. H. Taylor Jr. Single Barrel. EH Taylor is one of the many labels produced by our friends at Buffalo Trace. Taylor himself has been referred to as the “father of modern bourbon,” due to his strict adherence to better bourbon and whiskey aging practices and his importance and influence in getting the “Bottled in Bond” Act of 1897 (the Act required that spirits labeled as “Bonded”or “Bottled-in-Bond” must be the product of one distiller at one distillery during one distillation season. It also required that bonded spirits be aged in a federally bonded warehouse under U.S. government supervision for at least four years and bottled at 100 proof). Taylor also bought and expanded a distillery on the Kentucky river that survives today as… Buffalo Trace! So when BT launched it’s E. H. Taylor line of whiskeys, it was made up of spirits aged in the actual Taylor warehouses and using the Taylor recipes. 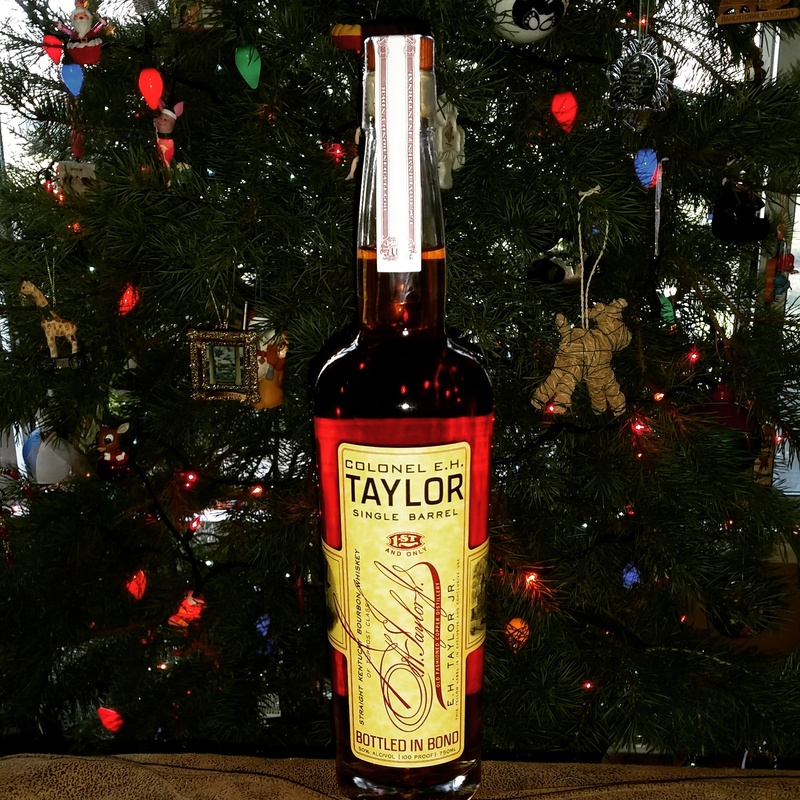 There are a collection of Taylor products – Small Batch, Single Barrel, Barrel Proof, Straight Rye – all of which are aged in the famous Warehouse C on the Buffalo Trace campus, and most considered exceptional. So how does this stories bourbon hold up? In short, spectacular. The Col. E. H. Taylor Single Barrel that we sampled was a complex and impressive pour. There is no barrel or batch information on the packaging or bottle, so I can’t note which bottles it shares traits with. There is also no age statement – an internet search came back with anything between 7 and 12 years. Armed with…surprisingly little knowledge, we dove ahead. First of all, the color is quite dark, and made me wonder more about the age. It was a deep amber, more akin to a 15 year old than a 7. It caught me off guard, to be honest. The nose kept me off guard. There was a sharp bite to the nose – while 100 proof is obviously pretty potent, it had the alcohol burn of a barrel proof. I backed off a bit, and found myself swimming in the scent of vanilla, cinnamon, toasted oak, a hint of butterscotch and, present and growing as the glass opened, black licorice. The taste presented what the nose hinted to. As a small sip, the EH Taylor Single Barrel has a thick almost creaminess to it, with a good push of corn and buttery caramel on the front. The middle opened up to a spiciness that belies it’s relatively low rye content – cinnamon, all spice, even a bitter dark chocolate, with a peppery, spicy finish. With a larger sip, the front burns a little more – again that 100 proof seems more like 120 – and while it retains the buttery sweetness in the front, slight bitter in the middle (more oak and tobacco is evident that in the small sip) it has a very long and potent finish, with oak, spice and a hint of peppermint. The Col. E. H. Taylor is not the most of anything – not the sweetest, or spiciest, or most complex. But it is a well rounded bourbon, easy sipping and very smooth. Perfect for a fire and maybe ushering in the new year?